The snow has been ushered away by a rich layer of sea fog and occasional night rain shower. The beginning of spring emerges in the form of deep green lawns and colonies of small white and blue flowers. Yesterday we made our statement against the possibility of another snowstorm by setting up the garden furniture in the middle of the thriving backyard. Living in an area with such a great contrast between the seasons has caused me to develop such a deep appreciation for the warmth of the sun and the breezes that don’t instantly freeze the primary layers of your skin. After months of confinement to the house by the brutal winter and stalking darkness, Norwegians jump at the first sign of sunlight. I must remind you that this point does not quite qualify as “warm” by Californian standards as the temperature still runs only slightly above freezing. Still, after the unforgiving winters, the chance to wear just one sweater, rather than three or four at a time, is nothing short of delightful. So here I sit, legs propped up on the white wooden picnic table, soothing sounds of Ray Lamontagne filling the air, sketchbook in my lap and lingering notes of ginger, cinnamon and cardamom from my chai tea on my lips. The day is warm and still, save for the occasional ocean breeze and buzzing of various insects in the flower beds. I’m working on allowing myself to savor this moment, this point in my life where I have no awareness of time or date, this moment where that doesn’t matter. This is not an opportunity that is shared with us very often and we must do all we can to enjoy it. The day will soon come when I can trudge through anxious days and wrestle with restless nights. The Norwegian bee is so massive it sounds like a faraway lawn mower as it flies around fighting the air and the pull of gravity. It’s wings are awkwardly small in comparison and look as though they might pop off and float away at the slightest breeze. As a result, it is so ineffective in it’s movements that, when able to gain any altitude, it simply ends up in a repeated body slam contest with the sides of the house. Occasionally it combines it’s need to find food and it’s flight skills and manages to land on a flower. By land I mean crush, as the delicate bud is slammed to the ground instantly by the sheer magnitude of the bee, the same interaction you’d imagine between a hippo and a straw. 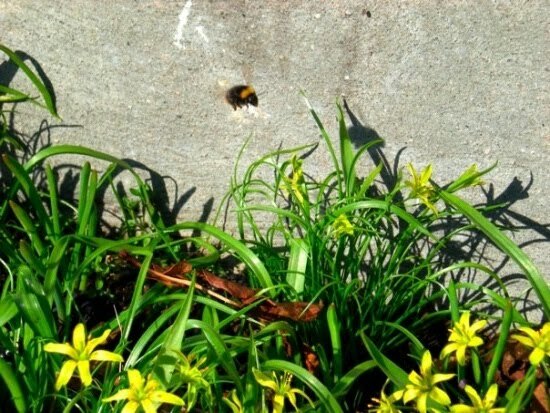 I feel a bit sad for the small flowers as they have just recently escaped the wrath of the snow only to be abused by the awkwardly monstrous bee. I feel as though my life here is suspended in time. In a parallel world I am at work, trying to settle in a new living situation after the repossession of our last house, stressing out about exams in Bio, Calc and O. Chem and worrying about getting enough shifts to survive this month’s bills. I feel anxious and guilty for not continuing that life, as if I’m not following the rules, yet I have an equal level of excitement for the life I will build here. I think we have a certain fear that once we create a life somewhere it is the one we have to live. I’ve always believed that you have to follow your gut and do what makes you happy. Obviously, we have to be smart about the decisions we make, not simply throw it all to the wind, but we will never know our true strength unless we push ourselves. When I look out the window, I still can’t believe that I am looking at Norway. And all that stands between this view now and looking out the window at Los Angeles is a split second decision I made four months ago. I could have coward at the idea and continued on without ever giving it a second thought. But once I uttered that single agreeing phrase the whole course of my life changed, as if it had never before been written. We think we know what will happen tomorrow or a year from now. We think we can work today to ensure those plans and determine where we end up. But in the end, there is no such control. No matter how strong the feeling, we are never prisoners of our future. You are currently reading Beautiful Day in the Sun at Buda-B.